Individual project research objective: The development of a Process Analytical Tool for the online determination of the enantiomeric excess in the crystalline phase of a suspension. At present, PhD student in School of Chemical and Analytical Science at University of Manchester UK. 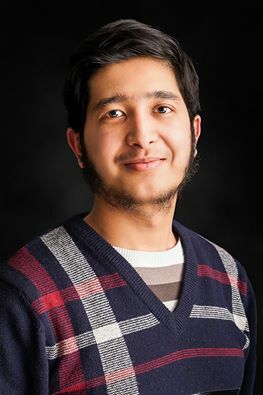 Ghufran started his journey in Academia by pursuing BEng in Materials Science from an esteemed institute (NUST) in Pakistan. He then laid his research foundation by doing an MSc with Honours in Advanced Materials and Process Engineering at Nuremberg University in Germany. This degree program was a unique combination of Materials Science and Chemical Engineering including advanced chemical processes and biological aspects as well. In addition to his research work at UG and MS level, he undertook an Industrial internship experience at the Oil and Gas Development Company Limited & Advanced Engineering Research Organization, learning about chemical processing, metallurgical and composite formulation and characterization. This provided him with an insight into industrial challenges that are usually faced in process engineering, making him aware of the need for standard operating procedures and test methodologies that are integral to industrial processes. Material Science is a subject area that fascinates him the most because of its applied nature, applicable to all basic necessities of life. Furthermore, imagination of material scientists in collaboration with engineers, chemists, physicist and biologists is continuously pushing the boundaries to new levels, as new products & applications are arising from Nano‐materials and new technologies are being developed to improve the quality of life of millions – and that is the most important aspect attracting him to this field, “to work for the benefit of mankind”. He specialized in surface engineering in his BEng that taught him importance of surface & interfacial properties. Major research interests are in Nanotechnology and Advanced Process, as he opted for these as his focal subjects during his Masters. The research field he has opted for in his PhD is an extension of this discipline. “Development of flexible thread sensor for application as strain gauge”, IEEE Sensors Journal Accepted, Oct 2016. “Applications of Raman Spectroscopy in Dentistry”, Applied spectroscopy reviews, Manuscript ID LAPS-2014-004, Nov 2014. Graphene as Transparent Electrode and Surface Enhanced Raman Scattering of Graphene on Split Ring Resonators, Poster presented on 2nd International Congress on Next Generation Solar Energy, 09-11, December 2013 Erlangen, Germany. Gallium Nitride GaN LED Based on Nano-rods, Poster presented on Engineering of Advanced Materials (EAM) Symposium 25th, November 2014 Erlangen, Germany.